In an age where kids average 19 hours a week on their connected devices, parents need an easy way to control, manage and monitor them online. T-Mobile FamilyMode to the rescue. BELLEVUE, Wash.--(BUSINESS WIRE)--Parenting in the digital age is a huge challenge, but finally…there’s real help on the way. 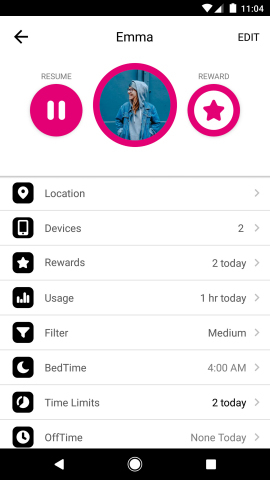 Today, the Un-carrier unveiled T-Mobile FamilyMode – a comprehensive digital solution that gives parents control over their kids’ online activities and screen time… on their phones and across the connected devices in their homes. 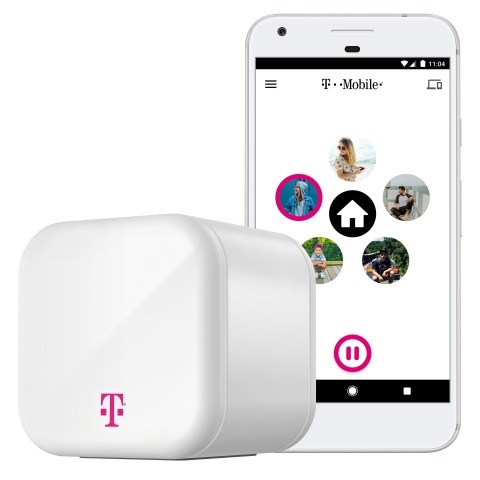 Available June 29, T-Mobile FamilyMode is an app and device combo -- the app gives you control over your kids’ phones and T-Mobile FamilyMode Home Base connects to your home’s Wi-Fi, giving you the control you need over your other connected screens. While the carriers’ solutions only cover the devices connected to their networks, T-Mobile FamilyMode lets you manage, monitor, filter and set time limits for your kids’ phones, tablets, gaming consoles, laptops, smart TVs and the other Wi-Fi-connected devices in your home… and it’s just $20 out of pocket for the device and $10/mo for the T-Mobile FamilyMode app! American kids get their first phone at 10.31 years old, and parents estimate that their kids spend an average of 192 hours per week across their connected devices. But with each new screen comes additional concerns for parents -- 68% feel a lack of control over their kids’ online habits and 71% worry about kids’ screen time3. Set daily internet limits on apps or platforms – Only give your child online access between 7pm and 8pm on school nights, for example. Or set a half hour screen time for Netflix to watch on your teen’s TV. You can even set bedtimes for each kid – now they’ve only got online access until a certain time of night. Choose which platforms, sites and apps to allow on phones and tablets – Younger kids not ready for social media? Turn off their access with one tap. Or pick and choose sites and apps to restrict – one kid’s ready for YouTube but another’s not? Control is in your hands. Instantly pause and resume mobile internet access – Asked the kids to do the dishes twice already, but the sink’s still full? Pause their devices easily! Last of the plates squarely put away in the cupboard? Resume! Filter out inappropriate content – Use customizable filters to allow or deny online access to certain sites and phone or tablet apps for each of your kids, like educational apps or Minecraft for the younger kids…Twitch and Steam for the older ones. Reward your kids with bonus screen time – Kiddo snagged an A on their essay and didn’t complain about meatloaf night? Go ahead, give ‘em a little more time on their gaming console for Fortnite with a quick tap. See where your kids spend their time online – See which apps and sites your kids use and even their internet search history. Know where your kids are -- With real-time location information, you’ve got peace of mind because you can check in on where your kids are as long as they have their phone…anytime, from virtually anywhere. 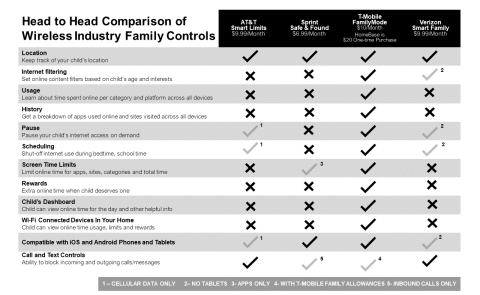 The carriers’ so-called parental controls aren’t even in the same arena as T-Mobile FamilyMode. The Duopoly’s family controls won’t allow you to set time limits for specific apps, sites and platforms. None of the carriers’ solutions give you the level of detail T-Mobile does about your kids’ web, app and platform usage. None tell you how much time your kids spend online per app and category – like social media or gaming. And of course, none cover your kids’ Xbox, smart TVs, computers and other Wi-Fi devices. Only T-Mobile FamilyMode has you covered. Beginning June 29, sign up for T-Mobile FamilyMode in T-Mobile retail stores, online or by calling 1-800-T-MOBILE. Then, just download the T-Mobile FamilyMode app from the app store on your Android or iOS smartphone or tablet! The T-Mobile FamilyMode app is just $10/month for all T-Mobile customers on a qualifying T-Mobile ONE or Simple Choice plan, and for business customers with 12 lines or less. The T-Mobile FamilyMode app is compatible with iPhones running iOS 9.3.4 or later or Android devices running 5 or later and can be managed in or out of the home, whether you’re on a Wi-Fi or cellular network. And adding the Home Base device is simple – pick one up at any T-Mobile store or call 1-800-T-MOBILE (existing customers can dial 611 from their T-Mobile phone). Home Base is yours at a promotional rate of just $20 – a savings of $80 off the suggested retail price for a limited time! T-Mobile FamilyMode is developed by the Un-carrier together with Circle Media Labs, Inc., a company creating technology that helps families find balance in today’s digital landscape. For more on T-Mobile FamilyMode, visit https://www.t-mobile.com/offers/t-mobile-family-mode. As America's Un-carrier, T-Mobile US, Inc. (NASDAQ: TMUS) is redefining the way consumers and businesses buy wireless services through leading product and service innovation. Our advanced nationwide 4G LTE network delivers outstanding wireless experiences to 74.0 million customers who are unwilling to compromise on quality and value. Based in Bellevue, Washington, T-Mobile US provides services through its subsidiaries and operates its flagship brands, T-Mobile and MetroPCS. For more information, please visit http://www.t-mobile.com. 1 Influence Central. Kids & Tech: The Evolution of Today’s Digital Natives. 1 Gallup. Time to Play. A Study on Children’s Free Time: How It Is Spent, Prioritized and Valued. 1 Nielsen. Mobile Kids: The Parent, The Child And The Smartphone.